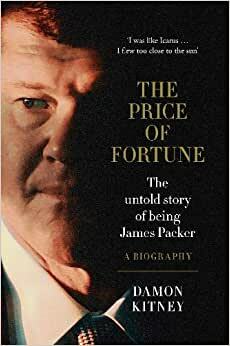 Start reading The Price of Fortune: The Untold Story of Being James Packer on your Kindle in under a minute. It's probably too soon to be writing the biography of James Packer who is barely past 50 with many productive years and many more interesting adventures ahead of him. In some ways he is the poor little rich boy and in others he is the supremely talented but angst ridden billionaire business tycoon. The book does a good job of pulling the curtain back and revealing how and why James has conducted his life and business affairs, warts and all. I think I would have enjoyed the book more if it had been written in a more chronological style. Instead, we jump around back and forth in time quite a bit. Being a long time Las Vegan I was particularly interested in those parts of the book dealing with James' business dealings here. I would have liked to learn more about them. They were all spectacular failures which almost brought his whole business down, but very little information was discussed regarding why the decisions he made were made. Overall I found the book to be entertaining and it seemed to be even handed in telling the story without a lot of puffery. I found it definitely worth the time and effort to read and would recommend it to anyone looking for a biography of a contemporary businessman. This book failed to tell a story. It didn't follow a clear timeline, it didn't dig into the awkward relationships or seem that balanced in its reporting. Instead, it came across as positive publicity for Packer, full of name dropping and a list of dollars made or lost. While aspects of the Packer family, particulalry Kerry, were interesting and detailed, I found that by midway it had become repetitive. The same details and major events were outlined half a dozen times. Throughout the book you can see the author truly cared about his subject and wanted to tell his story in context.